Toohxl jig is very well crafted and easy to use. which helps you to make bracelet in no time. 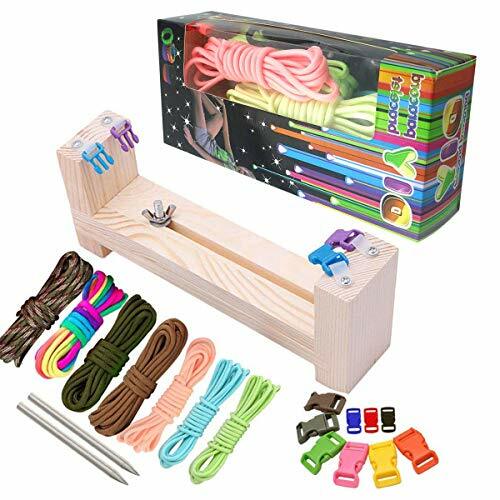 If you have been struggling making good quality bracelet with hands wait until you try it with this kit. It is super easy and efficient to use. Open up your box and get started. All you need is in the kit box for you to start right away. You do not have to buy any thing extra. Follow the instruction on the box before using if you are new to bracelet making. If you have any questions, please don't hesitate to contact us. We will get you back within 24hours. We endeavor to provide the best service and aim to contribute in the best way to fulfill all the needs of our valued customers. This set contains one jig tool,4 x 10 ft (3 m) of 550lb Paracord + 2Pcs Stainless Steel 550 Paracord Fid + 6Pcs 5/8" heavy duty buckles + 3 random colorful paracords and 3 quick release plastic buckle. This bracelet kit is great for anyone from beginners to intermediate to advanced users and is great for all ages and genders with the variety of colors you will receive! You can make friendship bracelets, survival bracelets, emergency bracelets, and much more! If you have any questions about this product by TooTaci, contact us by completing and submitting the form below. If you are looking for a specif part number, please include it with your message.